Torticollis is a result of unilateral tightness and shortening of one sternocleidomastoid muscle. The earliest description of this condition dates back to writings from the ancient Greek civilization. According to Plutarch, Alexander the Great may have had torticollis. Torticollis occurs in 0.4% of all births. A visible or sometimes palpable swelling, often referred to as a sternomastoid tumor, appears in a part of the muscle in infants aged 2-3 weeks. It often persists until they are aged 1 year. It is rarely bilateral and may be seen in older children in whom the mass was not previously identified. An end-arterial branch of the superior thyroid artery supplies the middle part of the sternocleidomastoid; obliteration of this end artery may be responsible for the development of muscle fibrosis. (See the image below.) As an alternative, primary trauma that temporarily and acutely obstructs the veins may lead to intravascular clotting in the obstructed venous tree. In infants, this clotting is evidenced by the development of a sternocleidomastoid mass, which eventually disappears and is replaced by fibrous tissue. Surgical view of sternomastoid fibrosis shows thyroid gland (1), inferior thyroid artery (2), fibrosis of sternal part of sternocleidomastoid muscle (3), brachiocephalic trunk (4), and normal clavicular part of sternocleidomastoid muscle (5). The etiology of torticollis is incompletely understood, though several theories have been advanced. [3, 4] Reports on the familial transmission of congenital muscular torticollis have been few. An idiopathic intrauterine embryopathy or the intrauterine development of sternocleidomastoid compartment syndrome may be responsible for the sternomastoid fibrosis. Musculoskeletal effects include compensatory ipsilateral elevation of the shoulder, as well as cervical and thoracic scoliosis. Wasting of additional muscles in the neck may be present as a consequence of sternocleidomastoid inactivity. Münchau A, Bronstein AM. Role of the vestibular system in the pathophysiology of spasmodic torticollis. J Neurol Neurosurg Psychiatry. 2001 Sep. 71 (3):285-8. [Medline]. Münchau A, Corna S, Gresty MA, Bhatia KP, Palmer JD, Dressler D, et al. Abnormal interaction between vestibular and voluntary head control in patients with spasmodic torticollis. Brain. 2001 Jan. 124 (Pt 1):47-59. [Medline]. Bredenkamp JK, Hoover LA, Berke GS, Shaw A. Congenital muscular torticollis. A spectrum of disease. Arch Otolaryngol Head Neck Surg. 1990 Feb. 116 (2):212-6. [Medline]. Davids JR, Wenger DR, Mubarak SJ. Congenital muscular torticollis: sequela of intrauterine or perinatal compartment syndrome. J Pediatr Orthop. 1993 Mar-Apr. 13 (2):141-7. [Medline]. Cheng JC, Tang SP, Chen TM, Wong MW, Wong EM. The clinical presentation and outcome of treatment of congenital muscular torticollis in infants--a study of 1,086 cases. J Pediatr Surg. 2000 Jul. 35 (7):1091-6. [Medline]. Shim JS, Noh KC, Park SJ. Treatment of congenital muscular torticollis in patients older than 8 years. J Pediatr Orthop. 2004 Nov-Dec. 24 (6):683-8. [Medline]. van Vlimmeren LA, Helders PJ, van Adrichem LN, Engelbert RH. Torticollis and plagiocephaly in infancy: therapeutic strategies. Pediatr Rehabil. 2006 Jan-Mar. 9 (1):40-6. [Medline]. de Chalain TM, Park S. Torticollis associated with positional plagiocephaly: a growing epidemic. J Craniofac Surg. 2005 May. 16 (3):411-8. [Medline]. Chate RA. Facial scoliosis from sternocleidomastoid torticollis: long-term postoperative evaluation. Br J Oral Maxillofac Surg. 2005 Oct. 43 (5):428-34. [Medline]. Schertz M, Zuk L, Green D. Long-term neurodevelopmental follow-up of children with congenital muscular torticollis. J Child Neurol. 2013 Oct. 28 (10):1215-21. [Medline]. Hummel P, Fortado D. Impacting infant head shapes. Adv Neonatal Care. 2005 Dec. 5 (6):329-40. [Medline]. Mikov A. Torticollis in an infant. Am Fam Physician. 2007 Oct 15. 76 (8):1197-8. [Medline]. Do TT. Congenital muscular torticollis: current concepts and review of treatment. Curr Opin Pediatr. 2006 Feb. 18 (1):26-9. [Medline]. Chen MM, Chang HC, Hsieh CF, Yen MF, Chen TH. Predictive model for congenital muscular torticollis: analysis of 1021 infants with sonography. Arch Phys Med Rehabil. 2005 Nov. 86 (11):2199-203. [Medline]. Dudkiewicz I, Ganel A, Blankstein A. Congenital muscular torticollis in infants: ultrasound-assisted diagnosis and evaluation. J Pediatr Orthop. 2005 Nov-Dec. 25 (6):812-4. [Medline]. Parikh SN, Crawford AH, Choudhury S. Magnetic resonance imaging in the evaluation of infantile torticollis. Orthopedics. 2004 May. 27 (5):509-15. [Medline]. Hwang JH, Lee HB, Kim JH, Park MC, Kwack KS, Han JD, et al. Magnetic resonance imaging as a determinant for surgical release of congenital muscular torticollis: correlation with the histopathologic findings. Ann Rehabil Med. 2012 Jun. 36 (3):320-7. [Medline]. [Full Text]. Morrison DL, MacEwen GD. Congenital muscular torticollis: observations regarding clinical findings, associated conditions, and results of treatment. J Pediatr Orthop. 1982. 2 (5):500-5. [Medline]. Celayir AC. Congenital muscular torticollis: early and intensive treatment is critical. A prospective study. Pediatr Int. 2000 Oct. 42 (5):504-7. [Medline]. Cheng JC, Wong MW, Tang SP, Chen TM, Shum SL, Wong EM. Clinical determinants of the outcome of manual stretching in the treatment of congenital muscular torticollis in infants. A prospective study of eight hundred and twenty-one cases. J Bone Joint Surg Am. 2001 May. 83-A (5):679-87. [Medline]. Tatli B, Aydinli N, Caliskan M, Ozmen M, Bilir F, Acar G. Congenital muscular torticollis: evaluation and classification. Pediatr Neurol. 2006 Jan. 34 (1):41-4. [Medline]. [Guideline] Kaplan SL, Coulter C, Sargent B. Physical Therapy Management of Congenital Muscular Torticollis: A 2018 Evidence-Based Clinical Practice Guideline From the APTA Academy of Pediatric Physical Therapy. Pediatr Phys Ther. 2018 Oct. 30 (4):240-290. [Medline]. [Full Text]. Jung AY, Kang EY, Lee SH, Nam DH, Cheon JH, Kim HJ. Factors that affect the rehabilitation duration in patients with congenital muscular torticollis. Ann Rehabil Med. 2015 Feb. 39 (1):18-24. [Medline]. [Full Text]. Han JD, Kim SH, Lee SJ, Park MC, Yim SY. The thickness of the sternocleidomastoid muscle as a prognostic factor for congenital muscular torticollis. Ann Rehabil Med. 2011 Jun. 35 (3):361-8. [Medline]. [Full Text]. Öhman A. The immediate effect of kinesiology taping on muscular imbalance in the lateral flexors of the neck in infants: a randomized masked study. PM R. 2015 May. 7 (5):494-8. [Medline]. Collins A, Jankovic J. Botulinum toxin injection for congenital muscular torticollis presenting in children and adults. Neurology. 2006 Sep 26. 67 (6):1083-5. [Medline]. Limpaphayom N, Kohan E, Huser A, Michalska-Flynn M, Stewart S, Dobbs MB. Use of Combined Botulinum Toxin and Physical Therapy for Treatment Resistant Congenital Muscular Torticollis. J Pediatr Orthop. 2018 Nov 16. [Medline]. Opherk C, Gruber C, Steude U, Dichgans M, Bötzel K. Successful bilateral pallidal stimulation for Meige syndrome and spasmodic torticollis. Neurology. 2006 Feb 28. 66 (4):E14. [Medline]. Sönmez K, Türkyilmaz Z, Demiroğullari B, Ozen IO, Karabulut R, Bağbanci B, et al. Congenital muscular torticollis in children. ORL J Otorhinolaryngol Relat Spec. 2005. 67 (6):344-7. [Medline]. Wei JL, Schwartz KM, Weaver AL, Orvidas LJ. Pseudotumor of infancy and congenital muscular torticollis: 170 cases. Laryngoscope. 2001 Apr. 111 (4 Pt 1):688-95. [Medline]. 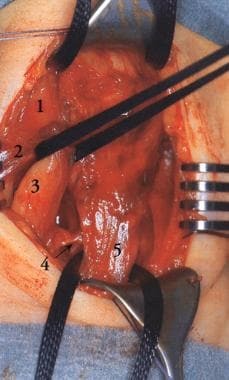 Sasaki S, Yamamoto Y, Sugihara T, Kawashima K, Nohira K. Endoscopic tenotomy of the sternocleidomastoid muscle: new method for surgical correction of muscular torticollis. Plast Reconstr Surg. 2000 Apr. 105 (5):1764-7. [Medline]. Tokar B, Karacay S, Arda S, Alici U. Para-axillary subcutaneous endoscopic approach in torticollis: tips and tricks in the surgical technique. Eur J Pediatr Surg. 2015 Apr. 25 (2):165-70. [Medline]. Teja VS, Agarwal P, Bagdi RK. Stealth surgery: Subcutaneous endoscopic excision of benign lesions of head, neck and trunk in children. J Minim Access Surg. 2017 Apr-Jun. 13 (2):109-112. [Medline]. [Full Text]. Ekici NY, Kizilay A, Akarcay M, Firat Y. Congenital muscular torticollis in older children: treatment with Z-plasty technique. J Craniofac Surg. 2014 Sep. 25 (5):1867-9. [Medline]. Appearance of torticollis as result of sternomastoid fibrosis in young child.